Only few companies can look back to such a long history of experience and tradition in CPU water block development and manufacturing as Alphacool. 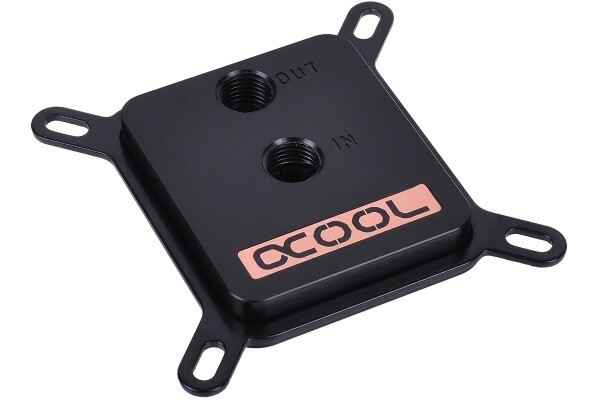 In the young water cooling sector, from 2004 to 2007, Alphacool aced many tests with the NexXxos HP and NexXxos XP CPU water block series. A multitude of awards and 1st places were the reward for offering the best water block on the market. With the "Alphacool HF 14 Yellowstone", Alphacool continued water block development. The result: Alphacool was voted "CPU water block manufacturer of the year 2011" by the PCGH user community. Since the beginning of 2010, Alphacool has been developing and testing the successor for over 14 months. Never in company history had such an effort been made towards improvement of a product, but the goal was clear: The new Alphacool NexXxoS XP³ was not only being developed to better its predecessors, but also exceed the cooling performance of all other products on the market. Different tests have already proven that the goal has been achieved and that Alphacool has created a true flagship water block. Cross-slotted structure: Having been patented for the NexXxoS XP in 2004, the cross-slot technology in the cooling plate was developed even further. An even finer structure of fins and channels now ensures stunning performance. The remaining pins are 0.5x0.5mm wide and have a height of 2.5mm. With this technology, it is possible to transfer great amounts of thermal energy very quickly from cooling plate to coolant..
Backflow channels: The patented backflow channels were also improved and optimized for maximum flow rates. Coolant can now be drained very efficiently above the pin structure, reducing flow resistance and improving cooling performance. Injection: A multitude of approaches for ideal coolant injection into the cooling structure exist, and many of them show great potential in computer simulation. Alphacool went one step further, and has actually realized many different technologies and tested them under real-life conditions. These prototypes were combined with different backflow possibilities, until an ideal solution was found: Slotted acentric injection in combination with backflow channels in opposite directions allowed a performance improvement which also worked on larger chips and Multi-core processors. Coolant recirculation: Unlike many current water blocks, where the recirculation of the coolant was only seen as a secondary issue, the NexXxoS XP³ was also optimized in this point. Hence it features an unusually large collection reservoir all along the pin structure of the water block. This allows coolant flow from all directions, removing it from the pin structure in a highly effective manner. Size: Both in regard to cooling plate dimensions (56x56mm) as well as top plate dimensions (57x67mm, plus mount), the XP³ has grown to be a full-size water block. Main advantage of the larger dimensions is optimal cooling of multi-core processors. Mount: The XP³ features a circumferential elevated strip, offering a secure hold for the mounting plate. This new feature allows switching of the cooling plate without having to disassemble and open the water block. With water blocks from the competition, installation of a different mounting plate is often a hassle without the necessary technical know-how, and not many users have the experience to be able to disassemble a complicated water block and reassemble it correctly without damaging it. Such worries are now thing of the past! Included with the water block come two mounting plates, one for installation Intel sockets, the other for use with AMD processors. Versions: Two versions will be available upon release: For budget-oriented users, the affordable entry-level version with Acetal is the right choice. For those looking for something a bit more advances, a version with brass top and elegant black nickel plating is available. Cooling performance of the Acetal version is only approximately 2°C behind the performance of the brass version, meaning that the Acetal version delivers top-notch performance at an affordable price. The water block is shipped in a protective packaging with specially cut foam inserts; the cooling plate has a protective foil attached to it. This foil must be removed before installation of the water block. 7 Vraag (vragen) in andere talen. Wo finde ich die AM4 befestigung für den Kühler und eine passende Backplate? Es ist mit beiden Kompatibel. Wird es für diesen Kühler auch zum Nachkaufen eine Befestigung für AM4 Sockel geben? Ja die wird es geben. Kurz vor dem Ryzen Release werden sie acuh verfügbar sein. Dankeschön. Weiß man ungefähre Preise schon? Gibt es eine Halterung für AM4 oder sind die AM3 Halterungen ausreichend? Für die XP³ Kühler wird es in Kürze entsprechende Halterungen optional zu kaufen geben. Gibt es bei diesem Kühler eine schöne Lösung um den engen Bohrungsabstand zu umgehen da ja zwei Alphacool HT 16mm nicht nebeneinander passen!? Bzw habt ihr da einen schönen Vorschlag? Mit einem 90° Winkel passen auch die größßeren Anschlüsse auf den Kühler. Alternativ muss man einen Anschluss nach oben verlängern mit einem 20mm Extender. Passen auf den Block 2 13/10er Schraubtüllen oder muss ich dafür Winkel nehmen? Sie können 13/10 Anschüsse verwenden, sie werden keine Problem haben. Entsprechende Bilder finden sich im Übrigen überall im Netz wenn sie nach dem Kühler googeln. Die AM4 Halterung ist die 1012957 (können Sie einfach im Suchbegriff eingeben), eine passende Backplate kann ich Ihnen dazu allerdings nicht anbieten. Der Block funktioniert gut, wenn er denn montiert ist. Ich habe eine AMD Cpu und der Rahmen für die Befestigung am Sockel hat einfach nicht auf den Block gepasst. Ich habe es zuerst mit Druck versucht, da ließ sich aber nichts machen. Letzten Endes habe ich den Rahmen etwas abgefeilt (gute 2mm) dann hat´s gepasst. Jetzt wo er montiert ist tut er das was er soll. Spitzenleistung, mein I7 2600k oc 4,6ghz wurde nie über 60°C warm(unter last), vllt mal bei einem heißen Sommer Tag. Im Kreislauf sind 2x360er Radis+GPU.